In 1967 the United Nations signed the socalled total pact in which was declared that not any government was allowed to own alien land. But no one talked about companies, individuals or juridical forms. However they soon discovered that they had made this mistake and decided to repair this one by the socalled "Moon Treaty" of 1984. This "Moon Treaty" of 1984 strongly forbids the exploitation of the moon and other planets out of profit goals as well as the property of them by all firms and individuals. However....... from all 185 member states only 6 of them have provoted, and so this proposal was rejected. Today this is still the situation. Conform the earthly laws everybody how first claims a piece of ground and have this confirmed notarially, may call himself owner of this part of land. In 1980 this was done by Lunar Ambassy, who from that moment on has become the legal owner of the moon. In this same year sir Dennis Hope contacted the ground registration office in San Francisco and made a request for owning the total surface of the moon. After studying the papers the office discovered that everything had been proceed legally and that everyone had been played by the rules so the ownership was allowed. The beginning of the new ministate. In May 2000 Lunar Ambassy has sold a piece of the moon, after which it has become property of the firm Noblesse, which on 8. 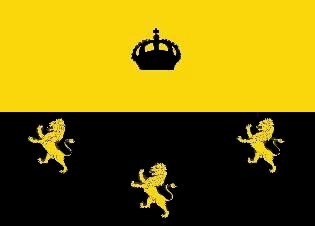 May 2000 has called this independent Principality Beauluna. Beau stands for "beautiful" and Luna for "moon". 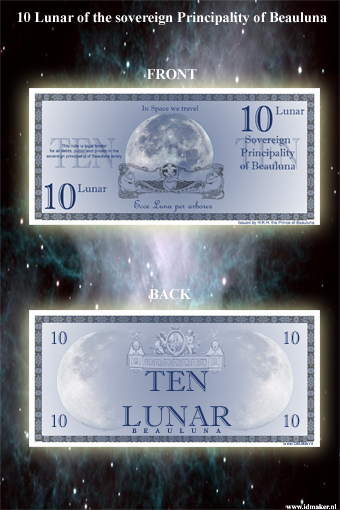 Here you can see the bill of 10 Lunar. 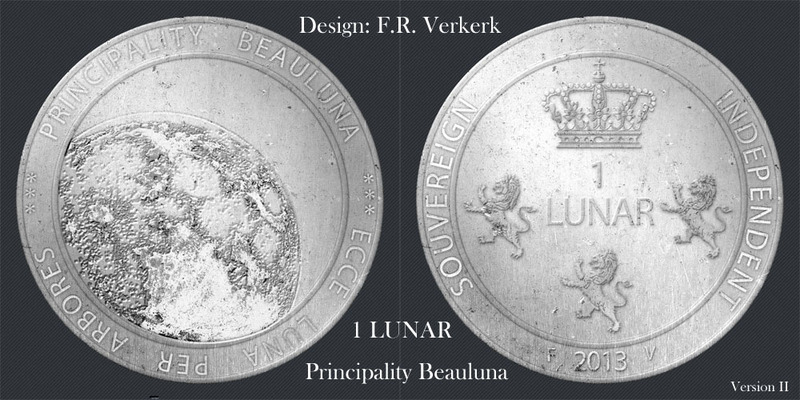 And the design of a 1 Lunar coin.